Please hop along with us! You have a chance to win one of the above stamp sets! Just comment on the DT members' blogs (don't forget this one) each day for more chances to win! (You do NOT have to comment on all the blogs each day! The names are drawn randomly!) All four winners will be announced on October 27, 2012 on the Mark's Finest Papers blog. You can go back and comment if you missed a day. (HINT: The more you comment, the more chances you have to win and comments on the MFP blog count twice!) The deadline for commenting is 11PM EST on Friday October 26, 2012. My tag card today is a double diagonal pocket card -- with two tags. My late husband was an avid fisherman, although he liked salt water fishing rather than fly fishing. But I'm sure he would have approved of today's set. 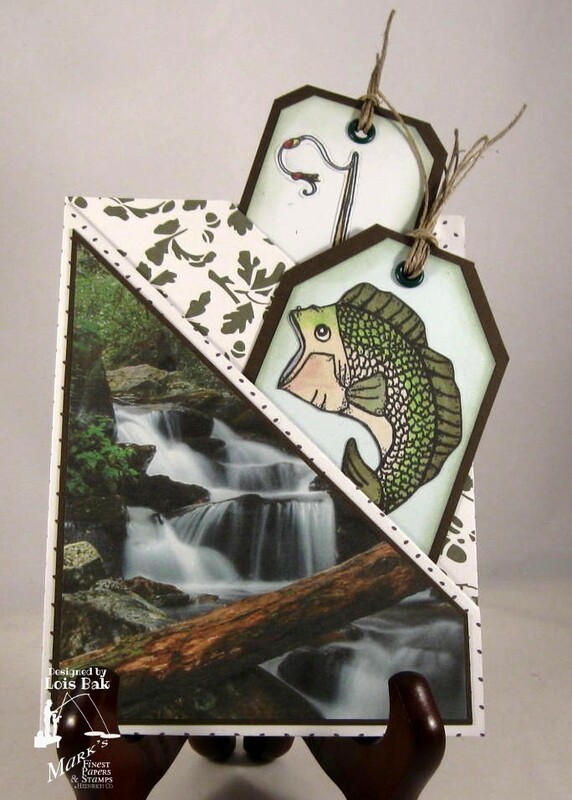 When I think of fly fishing, I usually think of a cold mountain stream; so I went onto the internet to find a photo that would work for the front of my card. After I printed it, I cut it down to fit. I also checked out the internet to see how to color this wide-mouth bass. Today on Speedy TV, Pat Garvin has a tutorial on the faux brick technique. 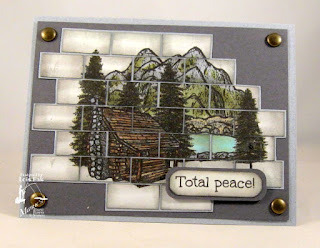 When I first saw the name of her tutorial (prior to her posting the actual directions), I erroneously thought it was going to be the same as a tutorial I had seen some time ago -- and I made this card, using the peaceful mountain scene from today's set. Though quite time-consuming, this faux brick wall makes an interesting look. After I read the tutorial, I saw that it was not the same one I had seen previously. 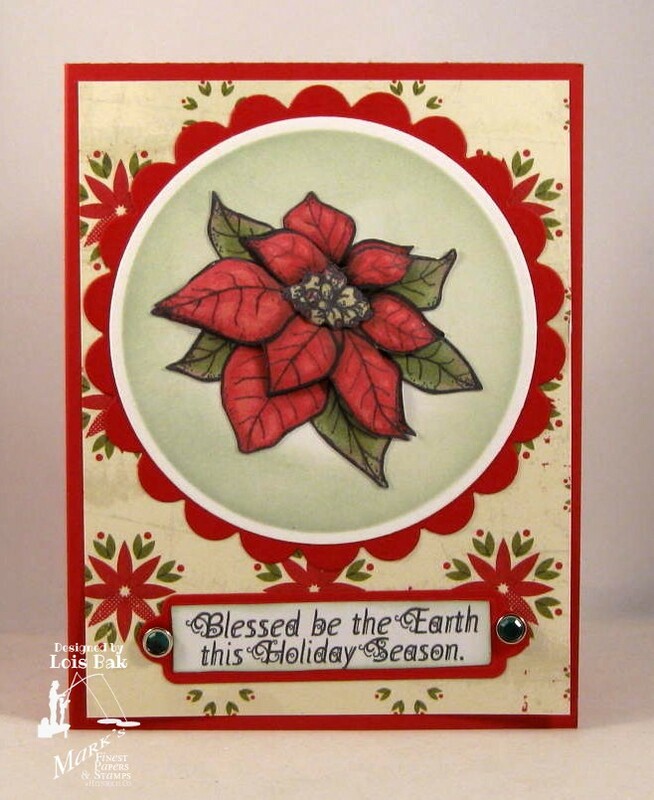 So I've got an extra card today -- made with Poinsettia Blooms (Wednesday's set). Be sure to check out Pat's tutorial on Speedy TV. 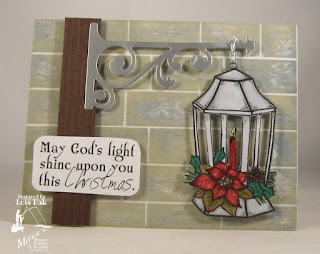 The inks I used for my bricks were Tim Holtz Antique Linen and Weathered Wood. I hope you have gotten more than a few ideas this week from our talented design team. We thank you for stopping by when you had the chance -- and be sure to comment on as many blogs as you can for more chances to win a free stamp set. My first card today is serving two purposes. 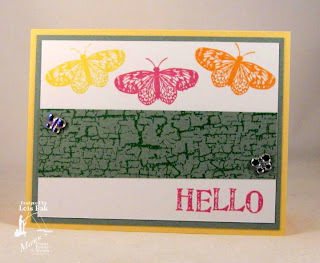 In addition to spotlighting today's MFP set, Cracked Hello, it is also my card for this week's CCEE challenge. Brenda O'Rear is the CCEE hostess for October, and this is her last week serving in that capacity. 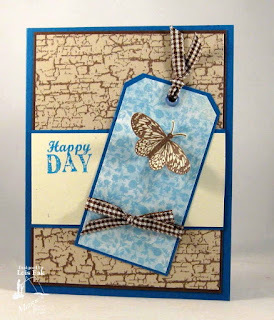 Her challenge actually was the reason for my theme of "tags" for this month's blog hop. She wanted us to use a tag on our card. If you'd like to play along with the CCEE team, check out our blog and link your card using Mr. Linky at the end of the post. I think blue and brown make such a nice color combo. Please note that the cracked background will NOT fit a 4" x 5 1/4" piece of cardstock. The image measures 3 7/8" x 4 1/2". I cut the stamped cardstock in half, glued it on a 4 x 5 1/4" piece of brown cardstock and covered the opening with the horizontal panel. My second card is pretty simple. I did add a couple of bling butterflies on the center panel to jazz it up a little bit. My tag card today is using a layout I saw some time ago on Page Maps. 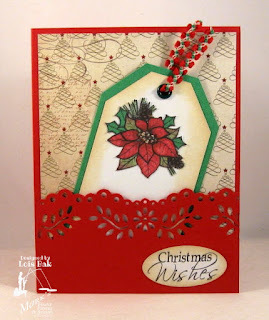 I used the small poinsettia on my tag and sponged lightly around the edges. 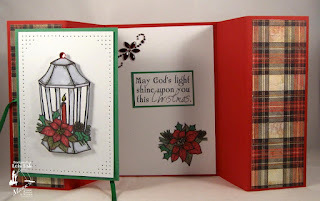 Michaels is now carrying MME Designer Paper pads -- the one I used on this card is called Santa Claus. It has muted shades of red and green. My second card is a Double Z-fold card, using my favorite image this month -- the poinsettia & lantern. I love plaids -- and especially Christmas plaids. I think I bought this Basic Grey Jovial paper pad specifically for this marvelous pattern. I cut out the lantern and popped it up for effect. It's hard to see, but the candle flame and center of the poinsettia have Stickles on them. As I love to paper pierce, I added a frame of piercing around the edge. The narrow ribbon is anchored under the main panel with a piece of tape. the sentiment, so I stamped and cut it out -- matting it in the same green as I used on the front. Then I added a bit of bling at the top. I actually made a third card from this set (can you tell that it was my favorite?) 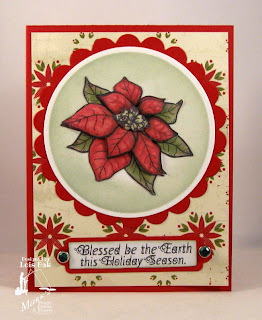 for today, using the larger poinsettia. 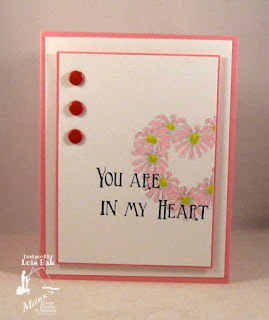 It's a simple card, but I wanted to show off the flower without a whole lot of embellishment. I actually stamped the image twice, cutting out several of the inner petals and popping them up for some dimension. Please hop along with us! You have a chance to win one of the above stamp sets! Just comment on the team members' blogs (don't forget this one) each day for more chances to win! (You do NOT have to comment on all the blogs each day! The names are drawn randomly!) All four winners will be announced on October 27, 2012 on the Mark's Finest Papers blog. You can go back and comment if you missed a day. (HINT: The more you comment, the more chances you have to win and comments on the MFP blog count twice!) The deadline for commenting is 11PM EST on Friday October 26, 2012. 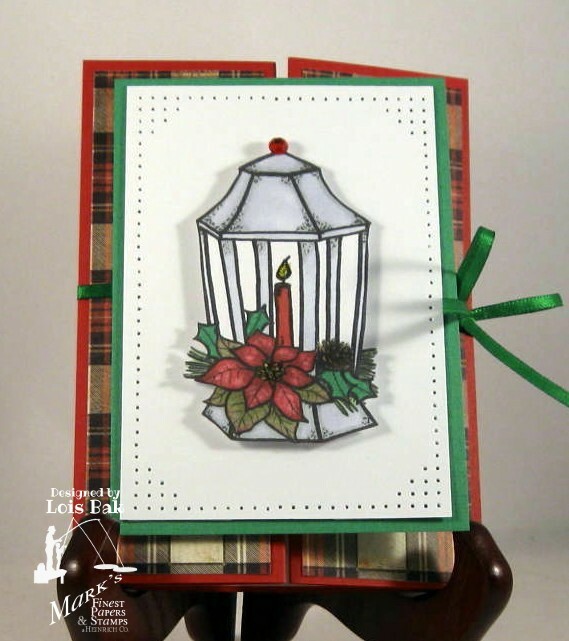 For several months I've had a "theme" running through my blog hop cards. This month's theme is TAGS. 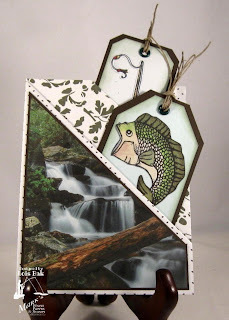 Today's set of small images was perfect for making tags for Christmas gifts. Chances are good that I'm going make a few more of these before the holidays roll around. The rest of the team has been busy creating with this set of cute little images. 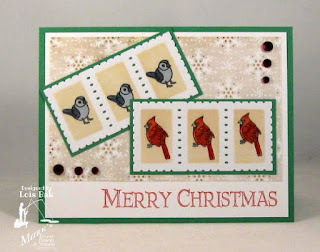 Be sure to hop over to their blogs to take a look -- and don't forget to comment for a chance to win a free stamp set. I used a new-to-me technique on my card today. Tammylee Newberry did a tutorial she called "Embossing on Pop Cans" for the Tutorial Team on Speedy TV. 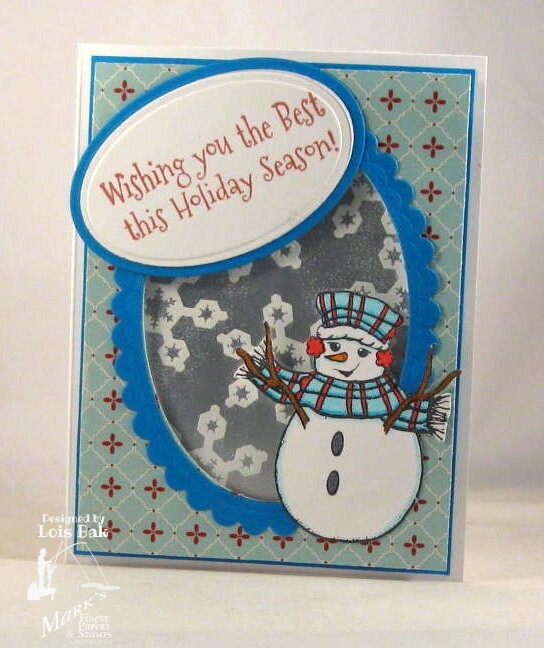 I combined this technique with the challenge that Brenda O'Rear gave the CCEE team this week to get some winter or Christmas cards in the mix and use snowmen. I cut my soda can open and washed it off. I then stamped the snowflakes in Whisper White and embossed with detail white embossing powder. I thought it would be easier to cut the cardstock rather than the aluminum, so I cut out my oval from the DP and then cut the border using a scallop and a straight die at the same time. To find the tutorial for this technique, go to Speedy TV. 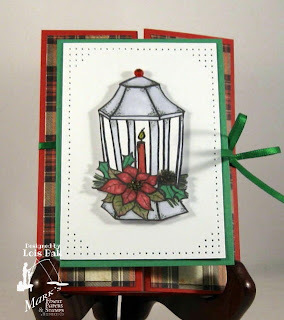 And, if you'd like to play along with the CCEE team, link your card up on the blog, using Mr. Linky at the bottom of the post. 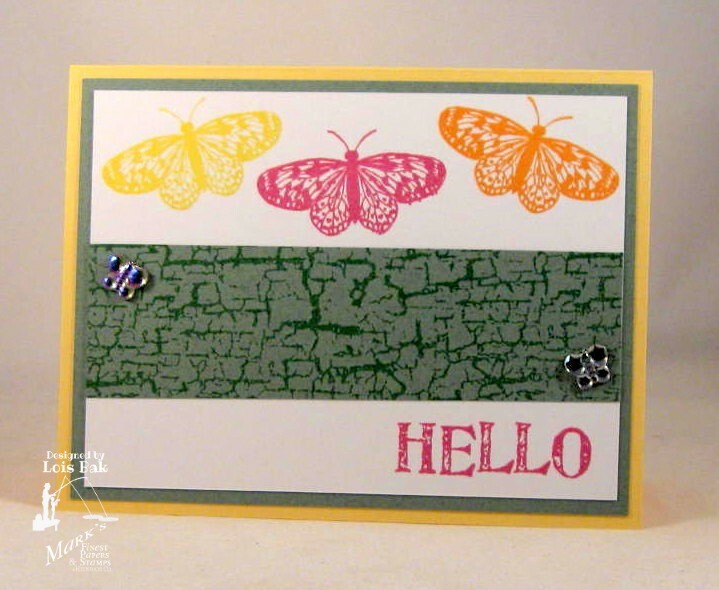 This week our CCEE challenge hostess, Brenda, is getting into fall -- her challenge: Fall Colors and a Punched Border. Nothing says fall colors like leaves, so I looked through my patterned paper and found a sheet of HOTP Fall Leaves that was just what I wanted for my background. I cut my cream-colored cardstock to 5 1/4" wide and then used the Martha Stewart leaf border punch on one side, saving the punched-out leaves to use later. I stamped and colored the pumpin; then stamped the image. 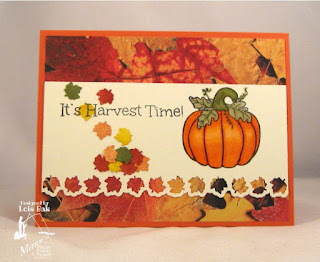 Using some Tim Holtz Distress inks, I colored the punched-out leaves various fall colors. I wanted the leaves to fall through the sentiment; so, after I colored them, I stamped the sentiment again on a piece of scrap paper -- with the yellow one getting part of the stamping. Both the pumpkin and the image are from Mark's Finest Papers, a Heinrich Company, in a set called Autumn Splendor. 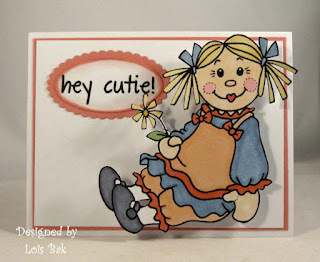 I hope you check out the rest of the cards on the CCEE Blog; and, if you'd like to play along, link your card at the bottom of the post using Mr. Linky. 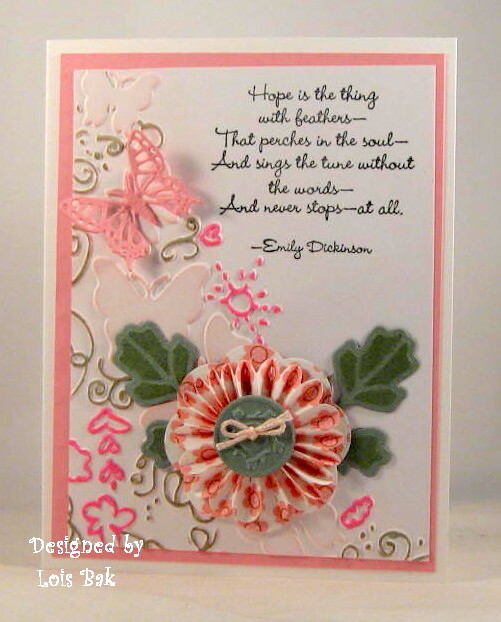 Splitcoaststampers is having their annual Hope You Can Cling To challenges during the entire month of October -- Breast Cancer Month. I've been playing along since the beginning of the month and just sent off my first package of cards to M.D. Anderson Cancer Center this morning. I thought I would share some of the cards I made this week. 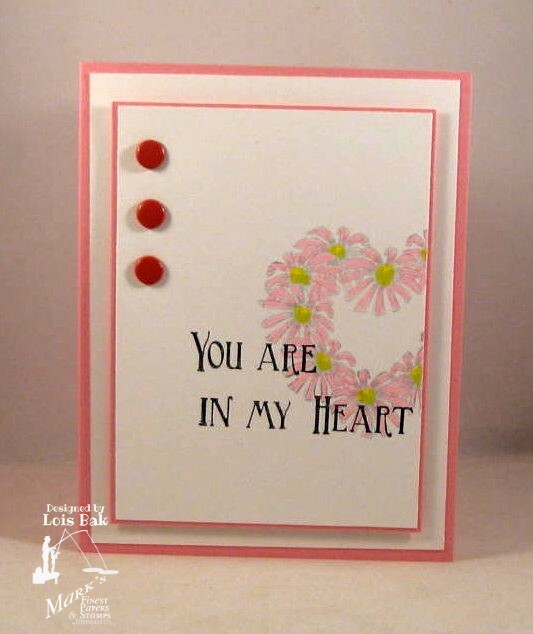 This was a challenge to make a card for a child. The challenge hostess generously provided several juvenile digital images. 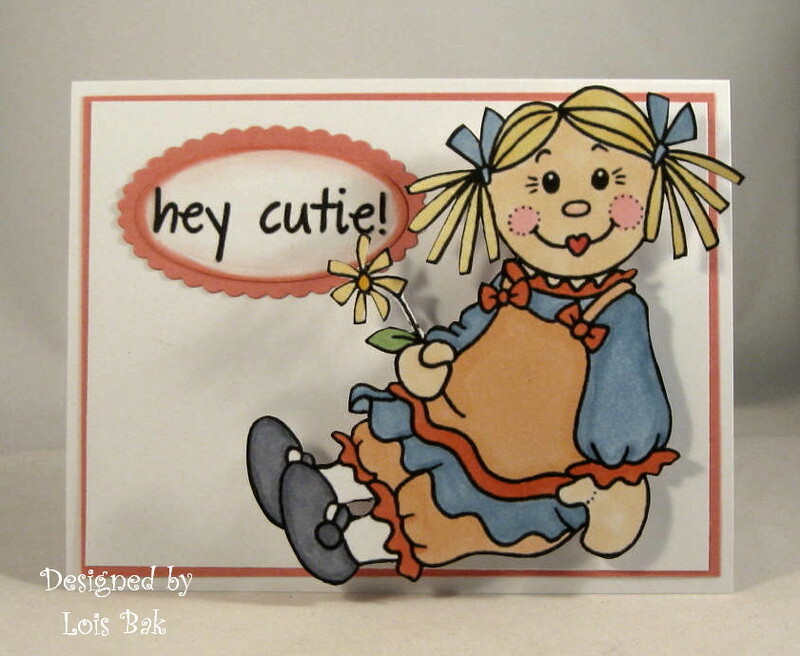 I attached my ragdoll to the card with a wobble spring. This challenge was to use five words. This challenge was all about COURAGE. My sentiment was about hope, but I think hope and courage go hand-in-hand. This challenge was all about cupcakes. We were to make a wrapper or container for cupcakes. 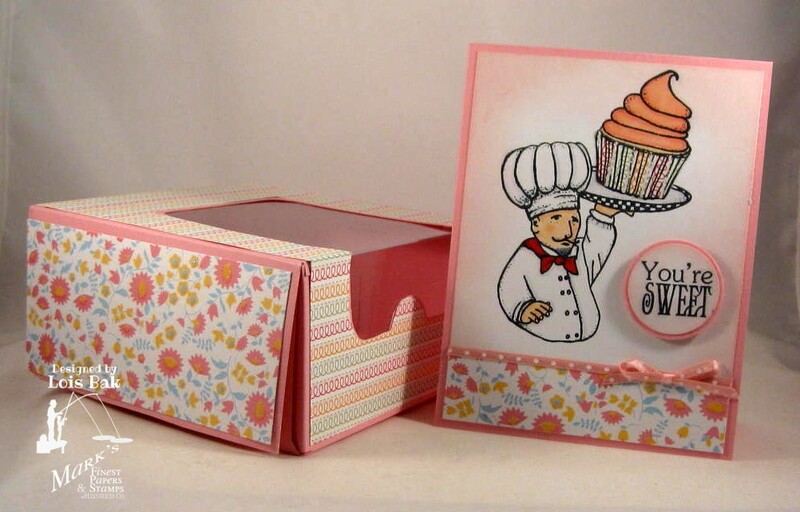 In addition, I made a cupcake-related card. 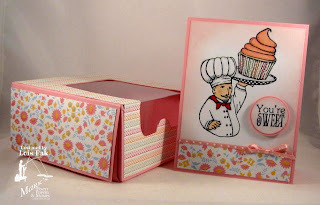 I mailed the card to MD Anderson Cancer Center -- not the cupcake box. If you'd like to play along with this worthwhile challenge, here's the master thread for all the SCS HYCCT challenges. It's a new month and a new hostess for the CCEE Blog. This month Brenda O'Rear (Benzi) is our hostess, and for her first challenge of October (eek! Is it October already?) 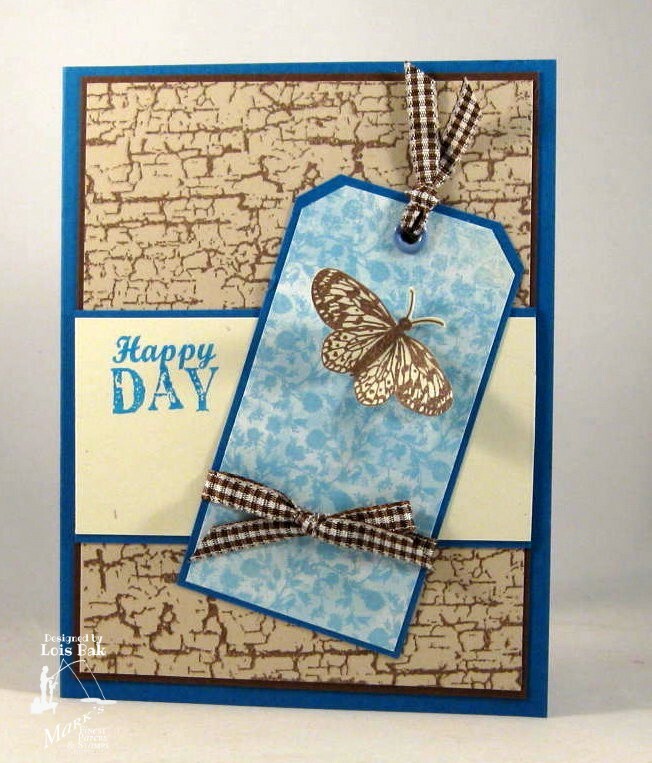 she wanted us to use chipboard as one of the elements of our cards. About two years ago I bought a box of DCWV chipboard pieces on sale and don't think I have ever used anything out of the box. So, thank you, Brenda, for making me pull out that box. I used a couple of autumn leaves and a photo corner from the chipboard assortment. 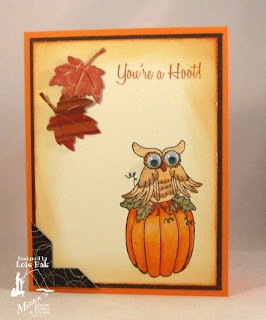 I love this little owl from Mark's Finest Papers, a Heinrich Company, set called Autumn Splendor. Her big eyes gave me the idea to use some googlie eyes to make them more prominent. This week's Tutorial Team on Speedy TV had a tutorial on distressing -- any kind of distressing (tearing, scraping, sponging). A little scraped distressing around the edge (just a little, I'm not a big distresser) and some sponging (sponging, on the other hand, I love) -- and I was done. I hope you check out the cards made by the rest of the team; and, if you're so inclined, we'd love to have you join us in the fun. Link your card to the CCEE Blog using Mr. Linky.